THE BRILLUSTRATOR: Dr. Zaius in the house! 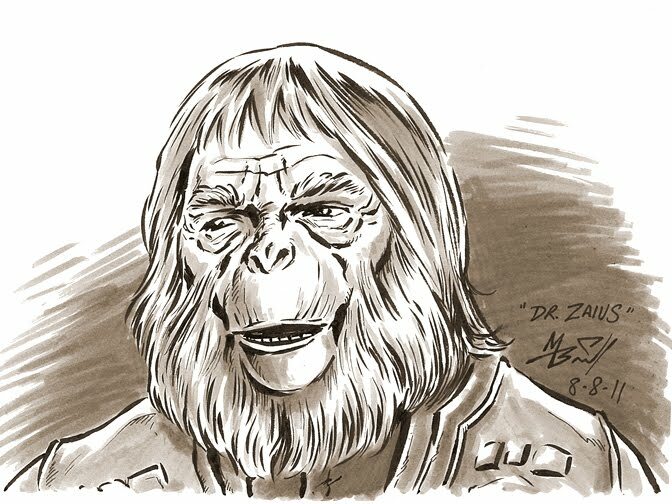 Today's sketch is a tribute to everybody's favorite simian ginger, the redoubtable Dr. Zaius! He told Chuck Heston, "Don't look for it, Taylor! You might not like what you find." And danged if he wasn't right. I just saw the new movie "Rise of the Planet of the Apes" over the weekend and I have to say that I was pleasantly surprised. I was concerned that it would just be a tacky, run-of-the-mill, scientists-playing-God, cheesy, preachy, doomsday horror flick. But in fact, I wouldn't call it a 'horror' film at all. It was a good story, beautifully filmed; it was enjoyable to watch AND it didn't go overboard with mayhem and cruelty--as it so easily could have. It was a REALLY excellent movie and I highly recommend it! What's more, I'm looking forward to a sequel! If they can maintain this quality, I think they could very easily build a whole new franchise! I'd love to see a new "Planet of the Apes" movie where the astronauts land and find a fairly advanced ape civilization like the one apparently described in the original novel. Apes in helicopters, that sort of thing, rather than the cost-cutting version with a primitive Ape City that they did for the original movie! One thing I also enjoyed about the new movie was its little tributes to the classic original, like the orangutan named Maurice. So, this sketch is for you Maurice, old and new.